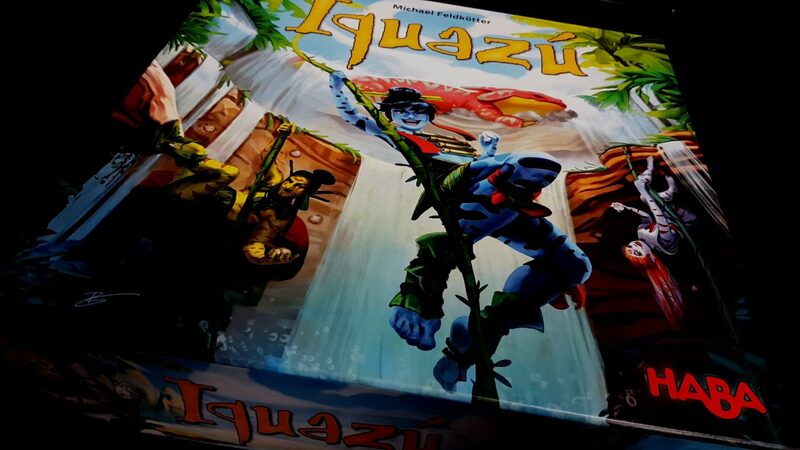 A review copy of Iquazú was provided by HABA in exchange for a fair and honest review. 7/4/2018 – We were playing this slightly wrong – bonus tiles get revealed when the water strip moves, not when it’s scored. That doesn’t change the accumulation of advantage that can make the game much less fun, but it does reduce how random it is. I’ve made some changes in the text of the review some of the accessibility teardown sections and grades to reflect this. Iquazú is a fine simulation of a capitalist economy – people can earn wealth that can price everyone else out of the market. That’s not what I expected from a game about hiding gems in a waterfall, but it is what it is. It’s a great game that does occasionally suffer from market forces leading to unassailable economic advantage but even that wasn’t enough to keep it from getting four stars in our review. It’s beautiful too – something that looks lovely on your table. That comes at a cost though, and that’s what our accessibility teardown is here to discuss! Sit down, make yourself comfortable. Strap yourself in. Be warned though – the first three rows will get wet. 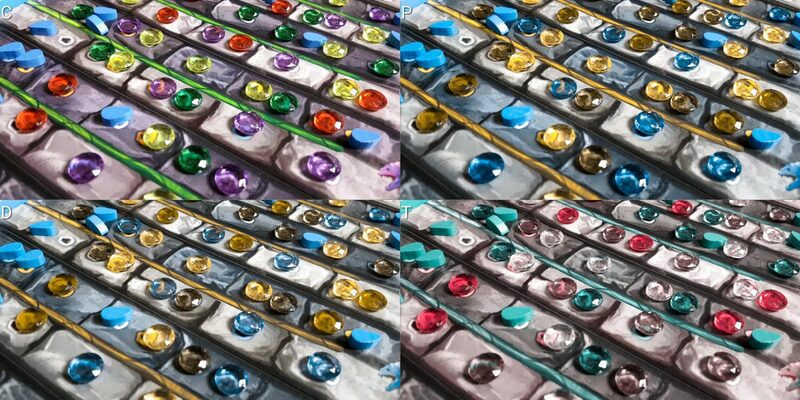 There are three colours you need to deal with in Iquazú, and for the gem slots and gems themselves colour is the only way they are differentiated. The colour palette is something of a problem. 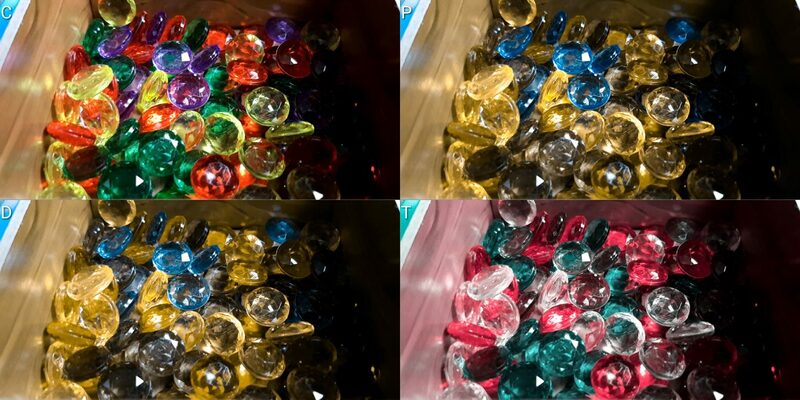 Red and green gems can mostly be told apart visually in good light for those with Protanopia and Deuteranopia because the specific hues used are relatively distinctive. 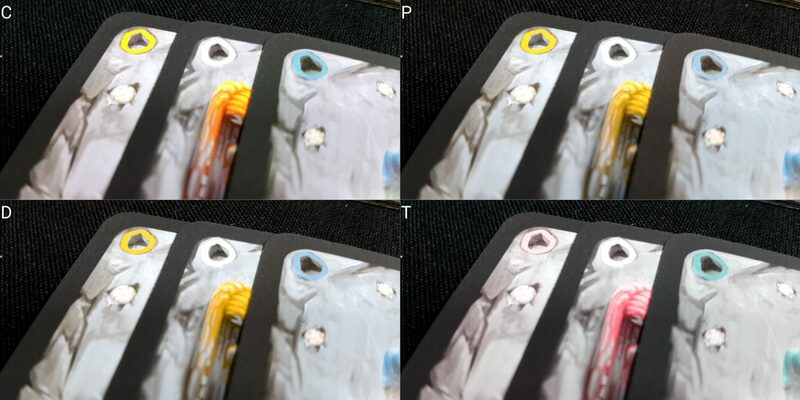 Close inspection on occasion might be required, and it’s not straightforward to replace the gems with components of a different colour due to the cardplay and the number you’d need. Even for those for whom colour blindness isn’t a problem will likely find this something of a issue because shadows, refraction and clumping of colours makes this difficult to do. 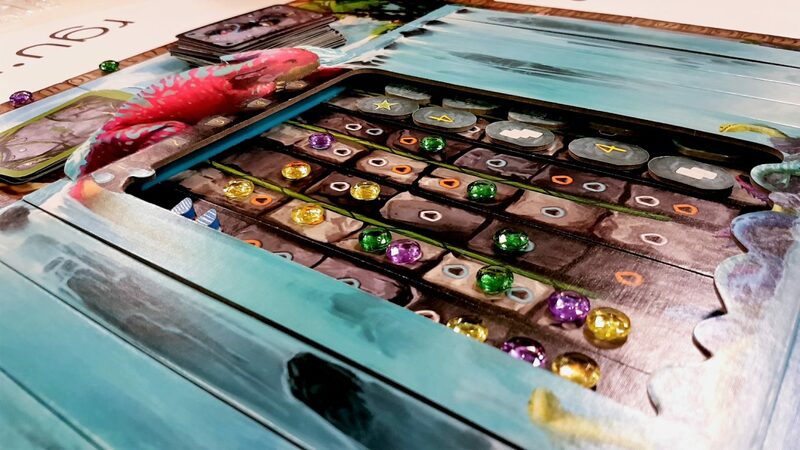 The easy fix is to remove all your gems from the box and place them in front of you but that means you have to play without one of the components that makes the game so visually striking. For the cards, different art is used for each colour although it’s all in the variation of ‘budget Avatar knockoff swinging on a rope’ and there’s no obvious way to link the figure on the card to the colour it represents. There are only three colours though and this will soon become a solved problem through familiarity. We’ll recommend Iquazú in this category but bear in mind some compensations will be required to make it play fluidly, at least in the short term. Iquazú is a game that requires a lot of visual processing of game state, albeit within a relatively small window of effect. Every turn you’ll be considering one of twenty five possible spaces, each of which may have one, two or three slots. Some of those will already be occupied. However, you need to examine them in terms of row, columns, the water droplets that drip into empty spaces, and the cards you have in your hand. The value of a space in Iquazú is a direct function of its spatial relationship to all other gems in each row and column, and in deciding your best action you need to be mindful of how pointed the competition will become as the waters rise. There’s a fair amount of intricacy in the game state too, with order and position of gems being as important as their presence. 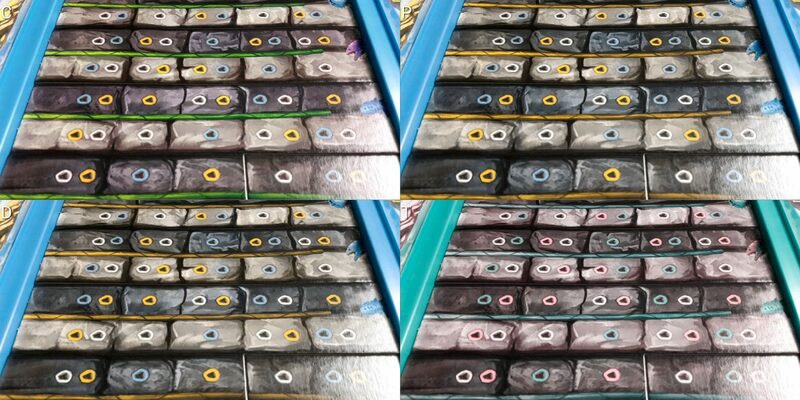 The choice to play in a row and column will be tightly bound to the order in which gems have already been placed and to whom those gems belong. Coupled to this you have a hidden hand of cards. The number of cards that you have in particular colours is important to know because they represent what is essentially your spendable currency. You are ranking in your mind the spaces you might like to select based on affordability and the momentum of the waters. That means essentially doing a cost-benefit analysis of each empty square in relation to how important you think it is. That in turn depends on the cost-benefit analysis each other player might make, and that depends on where all their gems have been placed. The cards are well contrasted and easy to visually parse since the only information they contain is colour. The problem is relating those cards to a board that becomes very visually busy as well as very visually intricate. As you might imagine, for those for whom total blindness must be considered this renders the game almost entirely inaccessible without a lot of support from the table. It’s not that the game is unplayable for those with less severe visual impairments but rather it’s going to require a very significant amount of extra cognitive processing to play competitively. It’s not even as simple as knowing who is going to win a row or column – sometimes it’s knowing in what order people are going to win and when . There are points for first, second and third place for four player games and your decision may not be based on what the winner of a column will get but rather the score that will come to the the person that is third. There are a lot of scoring opportunities in Iquazú and you’re not always most interested in the one that’s currently coming up. 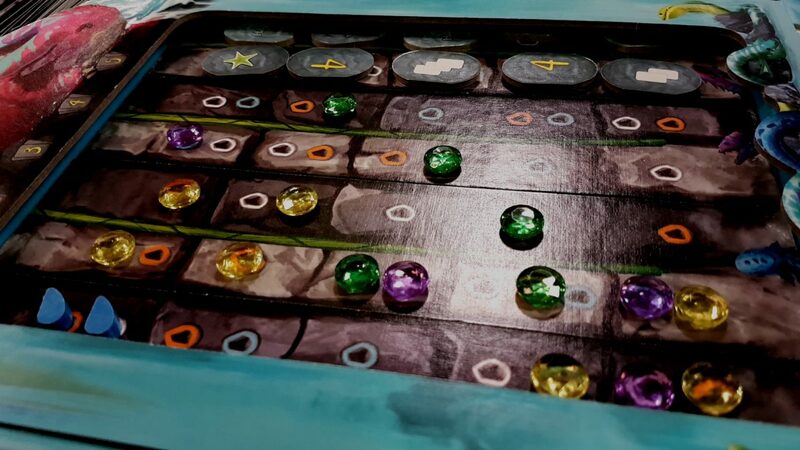 We don’t recommend Iquazú in this category, but for those with some degree of ability to visually explore the game state we suspect it’s playable with difficulty, with support from the table. Iquazú requires relatively complex understanding of higher level mathematical concepts, albeit at an intuitive level. It needs players to understand variable value propositions, risk versus reward, the decaying value of gems, the opportunity cost of placement, and the playing of gems within timing constraints. The rules are not complicated. Those rules though have complex implications. Consider the image above. This is about as simple a decision as you can hope for because it’s the last turn before the game ends. The player no longer needs to consider the long-term ebb and flow of value of placement. All three of these columns are going to be scored at the same time. It’s the red player to go. What should they do? The answer is ‘It’s complicated’ even at this juncture. Playing in the second column will win them a row if they can play on white but will be wasted otherwise. Playing in the third column will win them the row and also that column but it has a cost they may not be able to meet and in any case that column is the least valuable on the board. Winning the bottom row is possible by playing a white card, but it means abandoning the claim on the third. If you were the yellow player, or the purple player, or the green player? All of those calculations change. Now imagine that at the middle of the game where you also need to consider what you’ll get out of a placement for the five water strips for which it might live. It’s all of those calculations, expanding outwards in an ever-shifting matrix of ‘If I go there, then I get that but give up that’. There is a massive burden here in both of our categories of cognitive accessibility. Those with memory impairments have a less obvious barrier but there’s still an issue. Remembering how many score tokens of the different types that have come out is important strategic information in a game where getting the right bonuses at the right time can act like an accelerant. Knowing the percentages will yield real benefits with regards to investing in rows or columns. If you know most of the special power bonuses are gone you’ll want to invest more time in columns. If you know that most of the points are gone, you’ll want to invest in rows. Again, Iquazú has the model of a stock market but in this case past performance is indicative of future gains. This is only going to be a problem in competitive circumstances where players are actively memorising the distribution of bonuses, but it’s difficult to avoid some degree of that as familiarity with the game builds. The flow of the game too can be awkward because of the way the way the water box and gem box pass in opposite directions. While the rule of dealing with them is simple the implication of it is far more complex. The drops will come when the boxes intersect and they’ll intersect for different people at different times for some games. Playing well requires syncing your activities with the droplets and the pace of play – good players can essentially steal cheap points by being mindful of their opportunities. We don’t recommend Iquazú for those with fluid intelligence impairments but we offer a tentative recommendation for those with memory impairments only. That tentativeness in turn depends on how serious everyone is going to be about winning. It’s possible to lose and lose badly in Iquazú despite playing better than others at the table. The random distribution of bonus tokens occasionally results in the riches being distributed unevenly and this gives the lucky player an almost insurmountable advantage. If we think of cards as currency, getting a free draw of four cards is the equivalent of winning on a scratch card in the lottery of scoring. You have more money, and as such you’re less limited by the economy of the board. That becomes less impactful as the game goes on but if it happens early the game is punishingly cruel for those that don’t have a windfall in their past. Everyone has a fixed hand limit but most of the time reaching it is aspirational. If you get two scoring tokens and someone else gets eight cards… well, they’re probably going to leverage those cards to get far more points by investing in columns when you can’t afford the entry fee. You do know when a strip moves what rows are going to be most useful to you, but by that time you may not be in a position to benefit from it because the decisions were made when the value of your investment was hidden. Were it simply the case that this was the luck of investing in a risky strategy that would be one thing. The problem is that two players can get exactly the same number of scoring tokens and come away with radically different prizes. It doesn’t happen every time, but it happens often enough that it creates a problem in this category. Nobody gets kicked out of the game but it becomes obvious at a certain point that some players have been kicked out of having fun. Even if you’re the one benefiting from this it’s a problem because all of the fun of the game comes from competition over the best spaces. It’s like being a billionaire in a poker match and just raising until nobody can afford to call. Sure, you win but it’s hard to take much joy in it since your success was never in question. The result of this is that winning-to-losing differentials can be brutal, and nobody can really learn anything from the experience other than ‘Life’s a lottery, be lucky’. The last game of Iquazú I played with Mrs Meeple, I wanted to simply stop it half way through because I had already obviously won. Mathematically there was virtually no chance she could even equalise, much less overtake. However, in some circumstances even offering a face-saving early loss can be emotionally fraught. It’s not something especially embedded in the ethos of these kind of games. We’ll recommend, just, Iquazú in this category because it’s not a problem every time you play, but a major problem when it raises its head. If everyone understands that in some games there is link between competence and results that unravels it should be fine. You’ll know better than I will how your group is likely to respond to this issue, but when I envisage how I’d react to a bad winner in a game of Iguazu I know I wouldn’t respond well. 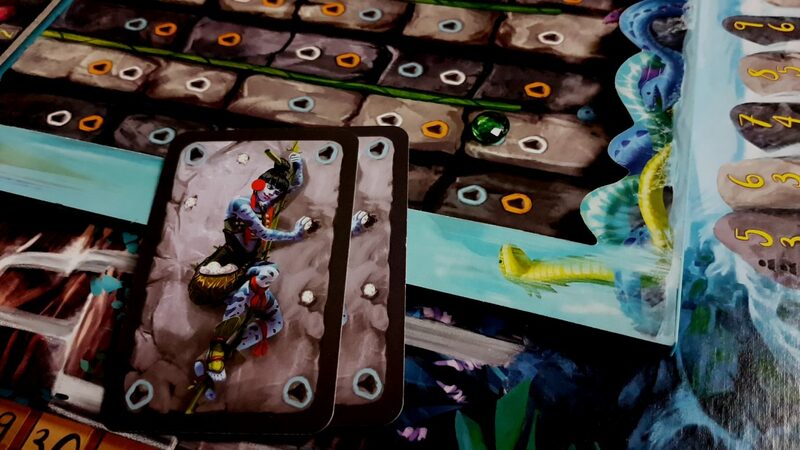 Iquazú requires players to hold a hidden hand of cards, but the hand limit is not excessive – twelve cards, and only the colours of these need to be seen. A single card holder could be appropriate for this although it would require some curation. Everything else in the game can be verbalised as a row or column and a colour. Columns are numbered, which is nice, and there are only five rows so the lack of a corresponding numbering there isn’t a major problem. It would have been nice to have had one regardless. Still, that window of actionable game-state does wonders in permitting ease of verbalisation. This is good, because otherwise Iquazú is a massive problem for those with fine-grained physical accessibility issues. The gems that you hold are small, need to be placed in tight constraints, and any nudging of the board runs the risk of changing the state of the game. For the bottom-most column of the waterfall, dropping a gem might even result in it skittering away under the water strips and then you’ll either need to abandon it or lift up the slats to get it back. This problem is intensified with the water droplets which are even smaller and of an awkward form factor. I can’t count the number of times I’ve struggled to fish one out of the water box and place it in the necessary gap without dropping it or knocking things about. It’s not difficult to repair any damage you do with this but it’s a frustration that the lush components lead to a less enjoyable game experience. 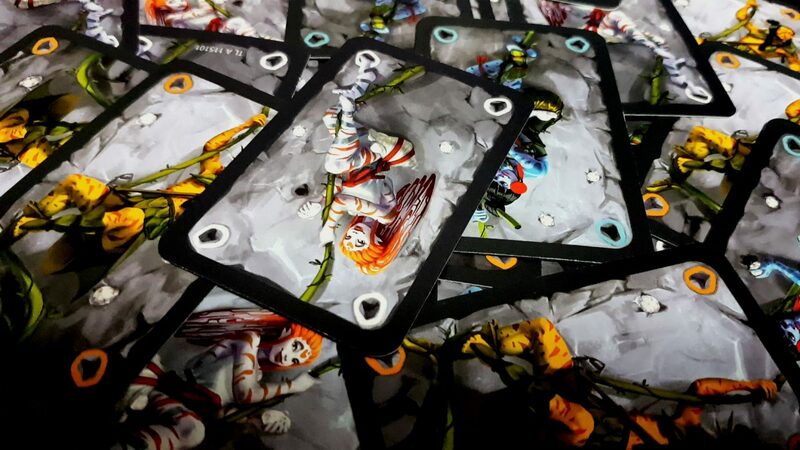 There’s a fair amount of shuffling required of the deck because it’ll run out a lot during the course of play and the discards will need to be shuffled for a new draw deck. Since cards are played in sets of colours (usually) this means shuffling is a more intensive process than it is in many games. You’ll need to make sure those clumped colours are properly distributed. It doesn’t need to be done by any individual player, so as long as there is one person that can do this comfortably it needn’t be a significant problem in this category. All of this too is leaving aside the physical chore of setup – if a player is able to do this comfortably it need not be a communal task but otherwise there’s a lot of putting things together and laying things out. That in itself might be an accessibility issue that needs to be taken into account. 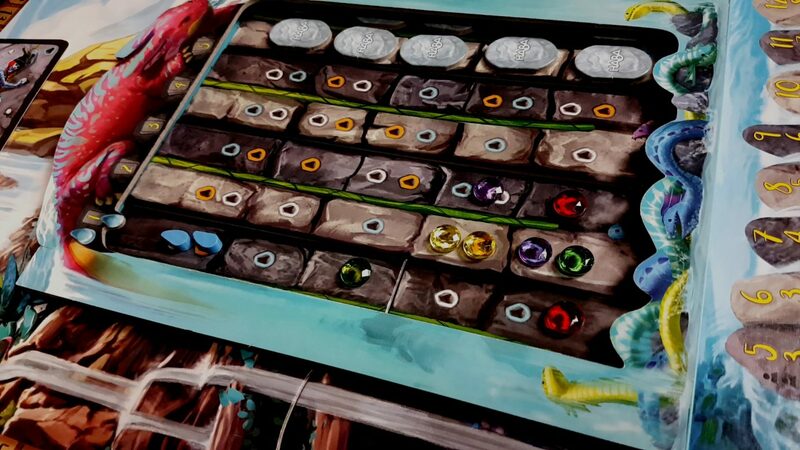 We’ll tentatively recommend Iquazú in this category – it is playable with verbalisation but for those that would rather physically play a game rather than ask someone else to do it the fiddly components are going to make that more of a chore than we’d like to see. There’s no formal need for communication in Iquazú and no literacy requirement. You can play it in stern silence if you like or leap up and down yelling ‘SELL SELL SELL’. Your choice really. We strongly recommend Iquazú in this category. It’s hard to take a view on ethnic diversity given that the characters in Iquazú are oversized smurfs of various hues. It’s an odd approach they’ve taken here though, although that’s odd in terms of ‘I’m not sure what they were going for’ as opposed to ‘I don’t know what they were thinking’. Iguazu (note the g rather than the q) is a real waterfall on the border between Argentina and Brazil which seems to situate Iquazu in the real world. However, it’s referenced in the manual as the ‘Land of the Waterfalls’ and the race of beings that are inhabiting the area are the Inox. The Rhujas are the baddies looking to raid the Inox to steal their gems. So – a real place sort of but a make-believe world? Or a co-incidence? Our world in a different leg of the trousers of time? It’s such a distinctive place name that it seems unlikely that the naming is accidental. Even in that the fictionalising of the waterfall is reasonably endearing. I’m not being critical, just curious. It seems like there must be some connection otherwise HABA have self-inflicted a whole pile of SEO injuries on themselves for no reason. There’s a good gender balance represented through the game, although that may be projecting gender characteristics onto a species where it doesn’t apply. I don’t know! Anyway, it makes a considerable effort to break out of the limitations of the ‘stern white men’ mould. It’s hard to say without knowing more about the physiology of the Inox and I suspect that’s a weird thing to ask for. There are obviously feminine characters, obviously masculine characters, and one or two pieces of art where it could be argued that it’s more diverse still. That’s going to be something in the eye of the beholder though. Iquazú has an RRP of around £30 and given the production values of what you get in the box you can’t begrudge a penny of it. Well, you can – but you probably shouldn’t. It plays well at all player counts, and while it’s on the pricey end of reasonable for a game that only goes up to four players it’s obviously as much a luxury product as it is anything else. Like Potion Explosion, part of what you’re paying for is the spectacle of the thing. We’ll strongly recommend Iquazú in this category. A number of these recommendations are tentative, and this has an impact on some of the intersections. Colour blindness compounding with physical impairments might make close inspection of the board difficult to do. Depending on the severity of each we might be inclined to suggest a player look elsewhere if that can’t be done comfortably. Memory impairments intersecting with emotional control concerns have a multiplying effect on the inaccessibility – not knowing how the token tiles have come and gone can lead to more uneven play experiences and that in turn is going to make the compounding advantages of an early lead harder to bear. Verbalisation of the game is simple enough that even severe communication impairments wouldn’t necessarily invalidate a recommendation. It would have a significant impact on flow to go through exhaustive indication of game actions rather than a more compact notation. However, the game would still be playable. There’s no facility for players to drop out of Iquazú, at least formally, but there aren’t any real differences in player counts except for the economy that goes along with value. An interesting feature of the game design is that gem placement essentially ‘times out’. That means if a player drops out early enough the rest of the game can progress smoothly to a different player count with nothing special needing to be done. It’s not possible for a player to come back in later but games of Iquazú in my experience are brisker than the box would suggest. That then is not necessarily an insurmountable problem. For play time the box suggests 50 minutes but I would say it’s closer to ten minutes per player barring accessibility considerations and player indecision. Your mileage, as ever, will vary. All of those production values have a cost – both in terms of financial impact and the accessibility of the game. 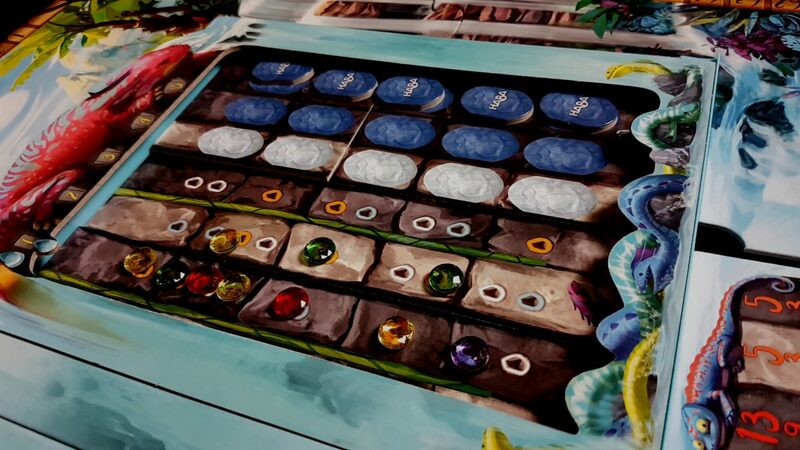 Iquazú looks lovely but the impact of that is in time to setup, fiddly components, and the risk of nudging the board and shuffling the game state. Nothing in life comes without trade-offs. Some of the problems we see here aren’t component based though – they’re to do with the game itself. It doesn’t look like it but Iquazú is a game of economic warfare. That puts a lot of pressure on the implicit ability of people to ascertain and compare uncertain value that can increase and decrease over the short and long term. Your gems are investments, and in evaluating their worth there’s a lot of cognitive processing that must be brought to bear. Especially because their worth will change the worth of all the other gems in play. It’s a recipe for absorbing play, but it’s also the source of the cognitive inaccessibilities we discuss. We liked Iquazú a lot – we gave it four stars in our review because its deceptively cutesy exterior hides capitalist carnage that turns every decision into a fraught puzzle of financial returns. As cruel as it can be on occasion, when it works well (and that’s most of the time) it is a beautiful game that is well worth your attention.